A possible GTX 680 specs leak? Below you can see a screen grab from PConline which purports to show the specifications of the GTX 680. While the specs are well within reason, without any way to verify this leak, or to translate the Chinese characters it is hard to have these specs confirmed or denied as they stand. Whether you should take the below with a good dose of NaCl is as of yet unknown but for now we can enjoy the speculation until NVIDIA finally releases the cards for review. Please feel free to add any speculations, doubts or other leaks in the comments below ... or even a decent translation would be great! You can catch the Google Translation here, if you wish to torture your brain with exclusive exposure. Does AMD have a 2304 stream processor GPU in waiting? The review for the AMD Radeon HD 7970 3GB card based on the Tahiti GPU and the new Southern Islands architecture was released on December 22nd with expected availability on January 9th. In that review we show a diagram of the Tahiti GPU and its 32 Compute Units (CUs) that combine to form the total 2048 stream processors (SPs). We asked and asked, but a die shot was never given to us for our review - a very non-standard practice for new launches. That started us wondering - was there something AMD was hiding from reviewers about the architecture? Were there some disabled CUs on the 28nm GPU that they had disabled for business, yield or clock speed reasons? Think of what Intel has done with Sandy Bridge-E or what NVIDIA did originally with the GTX 480 GPU. AMD assured us that was not the case - Tahiti is the full die enabled, 32 CUs and 2048 SPs. And, based on some of our own internal information, that seems to be 100% the case. This image from the site ChipHell.com appears to show the development sheets for Sapphire's upcoming Radeon HD 7000 series products and their internal codenames. There are some really noteworthy things to look at though starting with the Atomic lineup. While the Flex 6G is a 6GB card with 6 mini-DP ports on it running at the same clock speeds as our reference designs did initially, the Atomic RX card has a clock speed of 1335 MHz running on 2048 SPs and a pretty good memory overclock as well. If that is accurate, the performance difference between the Atomic RX and "Da Original" (likely the reference card) would be tremendous! Here is what is more interesting - another card listed above the HD 7970s that seems to include 2304 SPs, or 36 CUs. Running at a reference speed of 1000 MHz, this card would have a noticeable advantage over the current HD 7970 cards. What's more...? The Toxic ZX, if it exists, would run with 2304 stream processors at 1225 MHz! The performance of this card could easily beat out the Radeon HD 7970 3GB card by 35-45% with the shader and clock speed differences. So, what does this all mean? Probably nothing, but it is fun to speculate on a few things. It seems possible that AMD either HAD or HAS another GPU waiting in the wings based on Southern Islands to compete with NVIDIA's Kepler when it finally gets released. Even though these documents seem to indicate that, I kind of find it hard to believe that AMD would have been able to keep this secret from the media and the competition for this long. It is also equally unlikely that AMD was able to quickly tape out another chip that we are unaware of as even a somewhat moderate change like adding in four very modular CUs takes many months. And of course, we have to take in the possibility that these are all fake, or a decoy or were written up 18 months ago and plans have changed. Those are much less fun though. Update: 5:35, added a few points. If the convincing-looking leaked slides are to be believed, the upcoming AMD Radeon HD 7970 card is now naked before us with all its measurements laid to bare. While there still is nothing official as the embargo is not up yet, rest assured that at some point the full story will flood to the surface. What can be said is that if this slide is true, the 7970 looks to be a real beast of a card. The supposed reference specifications of the 7970… or are they? As you can tell from the heavily watermarked slide, AMD claims 3.5 TFLOPs of computing power from their 2048 stream processing units clocked at 925 MHz. Contrast this against the AMD’s assertion of 2.7 TFLOPs from the Radeon 6970’s 1536 stream processors and a core clock of 880MHz; while it is not an apples-to-apples comparison, it is a healthy buff to AMD’s portfolio. Also relevant, is a more recent slide claiming much-increased performance during tesselation which NVIDIA typically has maintained a healthy lead over AMD with. Possibly the most major point from the table is the power consumption: less than 3 Watts during idle. To give a bit of... pc perspective...: HardOCP measured the idle power consumption of the 6970 to be 24 Watts and the NVIDIA GTX 580 at 41 Watts. We are talking about an 88% decrease in idle power draw compared to AMD’s last generation’s single GPU powerhouse. It makes me wonder: how will this affect mobility graphics? According to OBR-Hardware, their slide is somewhat out-of-date; the expected peak is 200W give or take for the card on load, though I am sure that will vary depending on which brand of card you purchase. There is good news and bad news out of SemiAccurate about NVIDIA today. The bad news is that the chips are all Fermi, they have simply been shrunk to 28nm from 40nm. That makes the idea of mobile variants arriving first very probable with the respectably low TDP shown on the leaked chart. There at the bottom, in the row with the most question marks are the higher powered chips. The good news is that the list is incomplete, there is more in store for consumers in the same time frame. They will likely be 40nm but they will definitely not be Kepler chips. "What does Nvidia (NASDAQ:NVDA) have coming up for the post-Christmas GPU line? You have heard a lot about the 28nm parts, and here is what you will be seeing. The short story is this, Nvidia is putting out a bunch of Fermi shrinks on 28nm, and you will likely see the mobile variants first. They are as follows, with some information a bit blurred to protect the exact sub-species of mole involved." Turkish site Donanim Haber got the scoop on Bulldozer and the news is good. Compared to the first silicon we saw, which had 32 cores running at 1.8GHz, with this new leak we see seven models all running at much more respectable speeds. There are three 8 core FX CPUs of which the high end FX-8150 runs at 3.6GHz, 4.2GHz under boost. One of the two six core FX Bulldozers runs at 3.3/3.9GHz, the second called FX-6120 remains mysterious and similarly we know the quad core FX-4100 runs at 3.6/3.8GHz with the FX-4120 still having undetermined clock speeds. All are based on the 32nm Zambezi core and all will be unlocked Black Edition and support DDR3 up to 1866MHz. The actual performance when compared to SandyB is up for debate, a good starting point is this article at Real World Tech, which gives you educated guesses based on the leaked benchmarks. Part of the uncertainly lies in the new architecture and trying to interpret how 4 modules, each module with a single shared FPU/MMX/SIMD unit and two ALUs from an engineering sample. Hopefully, we should only have to wait 2 or 3 more months to find out for sure. "According to recent information from AMD, two quad-core, two and three of the six-core, including the 8-core processor for 2011 Bulldozer-based model to the market poised to offer 7 different FX. AMD's most powerful processor will be the standard 8-core 3.6GHz FX-8150 processor at 2.0 technology will serve and Turbo Core 4.2GHz operating frequency of up to increase. AMD's 8-core processor, the second how quickly the standard 3.1GHz FX-8120 has been working in the technology and the Turbo Core 2.0 4GHz can go up automatically." Windows 8 build leaked from D9 conference; screenshots. So Windows 8 was shown off at the All Things Digital D9 conference and surprise it was leaked. Naturally Microsoft did not show all aspects of the Windows 8 build at the conference; they must leave some cards hidden that are either not yet ready or otherwise not designed to be shown. Ziff Davis got a hold of someone who either had a leaked build of Windows 8 or otherwise access to screenshots that Microsoft did not intend to show. And what good are screenshots that are not in a slideshow? Care to take a spin around the leek? So we start off with the well-known start overlay with the typical tiles including weather, calendar, Computer, email, and Internet Explorer. The next image makes us feel immediately guilty for exactly a half of a second. The new interface extends all the way to the installer where you read the EULA and enter your personalization information. The windowing look and feel has changed with Windows 8 at least temporarily exaggerating the close button and minimizing the, well, minimize and full screen buttons. The ribbon UI is also seen exploding all across the interface including the file browser. Installations, at least of Windows software, are more integrated into the operating system. Lastly, the task manager is getting a facelift which may or may not be a bad thing. 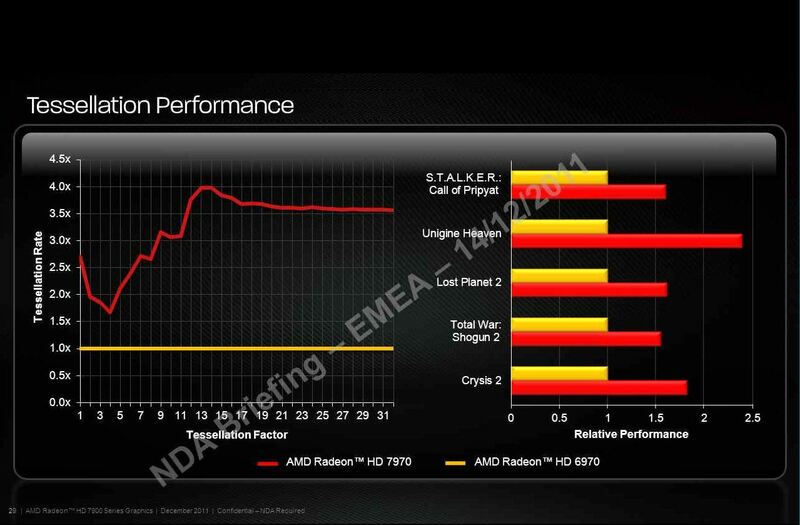 AMD's plans for 2011 are making the rounds as geeks love to share things that they shouldn't have access to yet. A set of slides from a presentation has hit the net, covering the positioning AMD sees for its upcoming products in the current market. AMD Vision is back in a big way with four separate logos running from HD Internet to Ultimate and even stickers denoting how many cores and GPUs are within a machine. Several new software enhancements are also mentioned such as AMD Steady Video which is intended to remove any shakes or wiggles from video posted to the net by someone with an unsteady hand. AMD AllDay Power demonstrates the power saving features that are unique to AMD ... at least in AMDs mind ... and they tout over 10hrs usage with their upcoming products. On the hardware side is a new name, Desna, which is AMD's answer to the tablet wars. This will be a DX11 APU which will compete to power the next generation of tablets. Hardware Accelerated Flash support certainly makes it stand out, as does enhancements to productivity software such as Office and the list of support for Win7 features. Check out the full deck of slides at NGOHQ. We now know what to expect from AMD's Llano, as far as pricing and initial model numbers. None of the Llano chips top $200 which is good as the Intel models that they will be competing against are also in that price range. Bulldozer is a little more expensive, with the lower end quad-core running $220 up to $320 for the high end octo-core, again bang on with Intel's competing Sandy Bridge parts. It is a question of the performance gap between Intel and AMD, which unfortunately remains unanswered for now. "AMD has started shipping its Llano APUs to notebook clients and will begin to market the APUs to channels in July 2011, according to sources from notebook makers. AMD targets to ship one million notebook-use Llano APUs in June, 1.5 million in July, and a total of 8-9 million for the whole of 2011, revealed the sources, citing AMD's internal estimates. If the shipment goals are realized, AMD will be able to boost its share in the notebook CPU segment to 15% by the end of the year, the sources commented."